When you’re in the market for a rifle scope, you’ll be looking for the absolute best rifle scope for the money. Unfortunately, many people mistakenly believe that in order to buy a high quality scope, they have to spend a lot of extra money in order to get it. While there’s no denying that there are a lot of extremely expensive scopes on the market that probably are the best of the best, the truth is that there are still a number of high-quality scopes sold by reputable manufacturers for a fair prices. There are many people who hunt using lower priced scopes and are successful. There are those who need to outfit their AR-15s with a high quality scope and go with something that meets the right balance between that quality and affordability. In this article, we are going to talk about the factors you need to keep in mind when looking for the best rifle scope for the money, and then present you with specific examples of excellent scopes that are also sold at fair prices and are perfectly affordable even for the budget conscious shooter. So you’ve saved up enough money for a low to mid-priced scope, but you don’t know where to start on your search for the best scope for your money. Today we are here to make you aware of the specific factors you need to get the best scope for your money. While it is true that rifle scopes are used for a variety of purposes, the specific scope you buy should be the best one suited to fit your needs. It’s also true that there are certain factors that all scopes should meet at the minimum regardless of what you will be using them for. It are these features that we will be talking about now. The first and arguably most important factor is that your scope has to be adjustable. If it is not, then you shouldn’t even consider it. When we say the scope must be adjustable, this means that it has to be adjustable for three things in specific: elevation, windage, and eye focus. Fortunately, a majority of scopes sold on the market are adjustable for each of these three things, so you shouldn’t encounter any difficulties with finding a scope there. It’s also important that your scope isn’t just adjustable, but easily adjustable as well. Most scopes are adjusted by knobs that are easy to turn on the side. Even the tiniest of adjustments can have the largest of impacts when it comes to accuracy, so take that into account when sighting in your rifle. The next factor to look for is magnification. There are two kinds of scopes that are available: fixed magnification and variable magnification. Fixed magnification scopes must be avoided at all costs because this means that they are only set to one level. You cannot zoom in closer to a target or zoom out for a wider view. Fixed magnification scopes don’t cost as much money, but paying a little extra for a variable magnification model is a worthy investment. There are more lenses to look through in a variable scope, which allows you to aim at targets that are a farther distance away. Remember that this article is about finding the best rifle scope for the money. If you want the best, you should pay more money for a scope that comes equipped with variable magnification. Your shooting performance as a whole will be greatly increased if you do. The next factor to look for in your scope is the crosshairs. The whole purpose of a rifle scope in the first place is to look at targets that are a far distance away from you and aim at them, which means that there must be a crosshairs or at least a reticle of some kind that allows you to do so. However, not all scopes have the same kind of reticle. Some have the traditional crosshair where the two straight perpendicular lines intersect one another in the middle, but others will have a smaller crosshairs or will have a simple dot. In addition, the color of the reticle may also be different. Cheaper scopes tend to have a reticle or crosshairs that is a plain black, but others may be red or green so that it stands out to you better. In all honesty, the color of the reticle in your scope should be based on your personal preference. The fourth factor to look for in your scope is image clarity. If your scope picks up too much glare and thus hinders your viewing of the target, it should be rejected. The scopes that offer the best clarity are those that have multiple coatings over the lenses. Another important factor to look for is for there to be space between the scope and your eye or the eye relief. As a general rule of thumb, there should be at least three inches of space between your eye and the scope. If you have to press your eye literally directly against the lenses of the scope in order to peer through it, don’t go with it. There are other important factors that your scope should meet, but these are by far the most important ones. This is especially true if you are looking for the best long range scope for the money where you need to be able to zoom in on targets at far distances away, have a good reticle for you to aim at them, and clear image clarity so that your eyesight is not obstructed in any way as you peer through the scope. The first thing you will noticed about the Barska Huntmaster scope when you look through it is how clear the image is. Barska invested heavily in their product to make sure that it looks as sharp as possible when you look through it. The IR crosshairs will also stand out to you when you look through this scope as possible, including in low light or dim conditions such as dawn or dusk when you’re hunting opportunities will be best. In short, this is a high quality scope with a sharp image and clear reticle that works beautifully in darker times of day and makes sighting in this rifle incredibly easy. 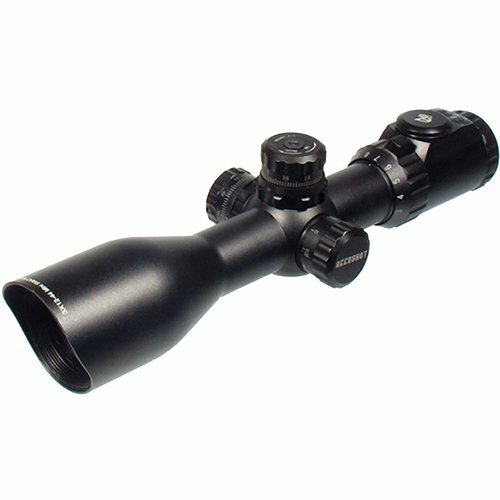 What’s more is that this scope is sold only for the $75 range, making it an incredible value and an excellent investment. This is definitely one of the best hunting scopes for the money that you can buy, which is why it makes our Best Rifle Scope list. Bushnell is a popular brand in the scopes and optics world considering that they’ve been in the business for over half a century. What is neat about them is how they don’t sacrifice quality while still producing scopes in the low to mid price ranges. Their Banner 3-9x40mm Multi-X Reticle scope is no exception. When you don’t want to spend hundreds or thousands of dollars for a right scope, you can have the Multi-X reticle scope for a little over a hundred dollars. Bushnell made sure that their scope comes with plenty of eye relief, six inches to be exact with the Multi-X. It’s also easy to sight in, and you’ll be shooting grips that are less than a half inch wide at over a 100 yards in no time. What also stands out about the Multi-X is its versatility when it comes to the number of firearms that it can be mounted onto. Customers of Bushnell have mounted the Multi-X scope on everything from modern AR-15s to older Mosin Nagant rifles and even shotguns, which can shoot slugs to take down big game such as deer. This is another scope from Bushnell that is another excellent value for your money. By the name of this scope, Dusk & Dawn, you can probably guess that Bushnell designed this scope to be specifically used in low light conditions. This scope comes equipped with Bushnell’s DDB (Dusk & Dawn Brightness) multicoated lens technology that enhances overall vividness and clarity when you peer through the scope even when it’s darker outside. There’s also almost three and a half inches of eye relief between you and the scope as well. The Dusk & Dawn scope is also completely fog proof and waterproof with elevation and windage adjustments of ¼ MOA. A magnification of 3-9x and a 40mm objective lens means that this scope is designed well for long distance shooting and can zoom in on targets at long ranges. The real standout of this scope is the price because it costs just a little over $100. 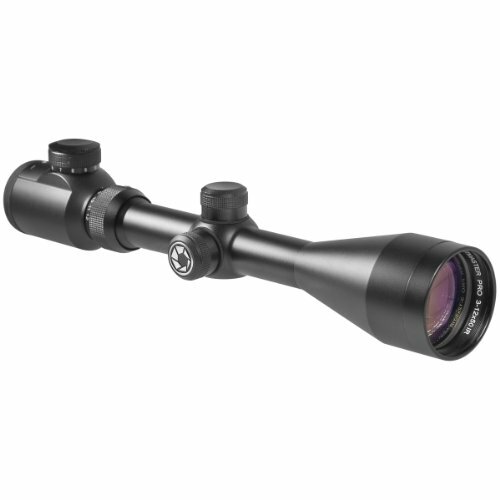 This price combined with its array of impressive features that you would expect on a vastly more expensive scope are what easily make it one of the best hunting rifle scopes for the money. A nice scope at a nice price. Just because you’re paying a lot less in money for the UTG doesn’t at all mean that you’re going to be trading off quality. This is a well built scope that is incredibly easy to mount. It seriously shouldn’t take you more than five or so minutes to mount this scope onto your rifle. The lenses are also protected by covers on either sides that, with a flick of your finger, will flip up and out of the way. The elevation and the windage are also easily adjustable – you will hear them firmly lock into place as you twist the knobs, in contrast to some other scope that can be a little more difficult to listen to when you turn the knobs. Many rifle shooters are in a position where they need to purchase the best rifle scope for the money. This can be a challenging task, but it’s not impossible. It certainly shouldn’t be impossible now that we’ve shown you the specific factors that you need to look for in a scope and examples of four specific scopes being sold on the market right now that strike just the right balance between affordability and quality. It’s not something that’s too much to ask for. Remember that a scope without the features we have listed will never perform as well as a scope that does have the features. That’s why you can’t overlook or ignore any one of the features that we talked about earlier in this article and that each of our examples definitely has. The best long range rifle scopes for the money have these features. If you really want to get the best rifle scope, these features have to be on it. As a result, you’ll find yourself becoming a more accurate shooter in no time. Thank you for visiting Reloadingpresso.com. If our article has helped you make a decision about the best AR-10 rifle scope for you, please click through to Amazon using one of our buy buttons. We are an Amazon Affiliate website and we keep our website running through the small commission we receive when you purchase a rifle scope from Amazon after visiting our site. There is no extra expense for you – the price is the same as if you went to Amazon directly. If you’re looking for more than just the best rifle scope, please review our Best Single Stage Reloading Press Buyers Guide and our Best Gun Safe Buyers Guide.